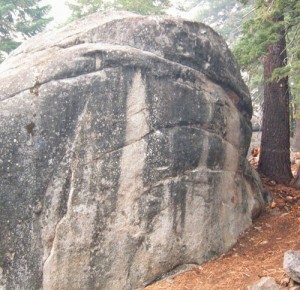 This is the most convenient bouldering to the camping area and Main Upper Parking Area. Most of the boulders are elusive—they are hidden in the trees, a few hundred feet from each other. The Car Park Boulder and Haze Boulder are great at the end of the day when your friends start complaining of sore tips but you still want to charge. There are another 30+ boulders down at the Lower Road. Which SuperTopo guidebooks cover Timberland?